Sift together the cake flour, sugar, baking powder, salt and cinnamon. In a separate bowl, combine the buttermilk, orange zest and extract. Stir into the dry ingredients along with the eggs. Add the melted butter and mix until just combined. The batter will be thick and quite sticky. Spray a regular size doughnut pan with nonstick spray. Fill each cup about 2/3 full with batter and bake for 7 to 9 minutes until the doughnuts are golden and spring back when touched. Cool doughnuts in the pan for 3 to 4 minutes, then transfer to a cooling rack. For the glaze, combine the confectioners’ sugar, milk and extract in a shallow bowl. 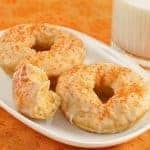 Dip the top of each doughnut in the glaze and transfer to a plate. Sprinkle with colored sugar if desired. Try to consume your doughnuts within 24 hours of making them as, like any doughnut, they get stale rather quickly.